Maybe it’s my love affair with San Francisco or my Italian heritage but whatever the reason, I LOVE cioppino. When dining out and seeing it on the menu, I will always order it, no questions asked. For this reason I have tried hundreds of varieties. 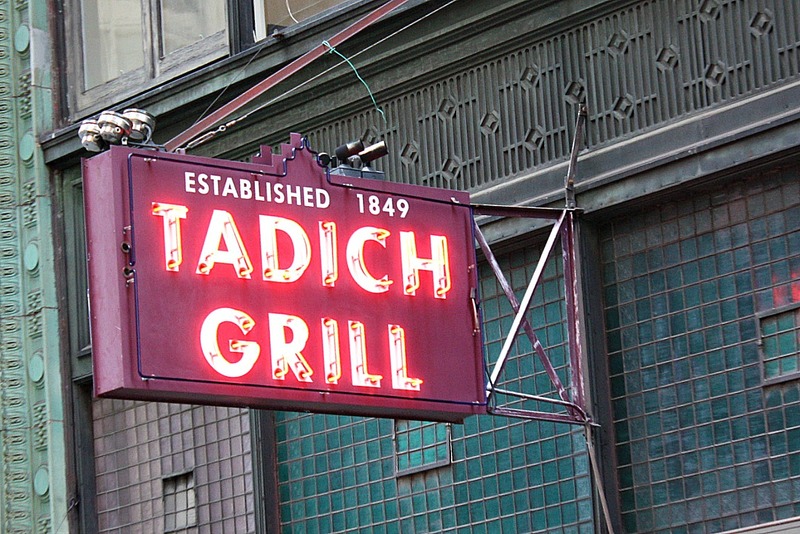 Some are thin like soup, others thick and stew like, some served over pasta, and some served with a large chunk of garlic bread but no matter how many I’ve tried I still believe that the savory, thick, and seafood heavy version served at Tadich Grill in San Francisco is hands down the very best. Created in the North Beach neighborhood of San Francisco by Italian-American fisherman, cioppino was a way to share the day’s fresh catch. Legend has it that at the end of the day a large pot would be passed around the docks asking everyone to “chip in” a bit of their catch. 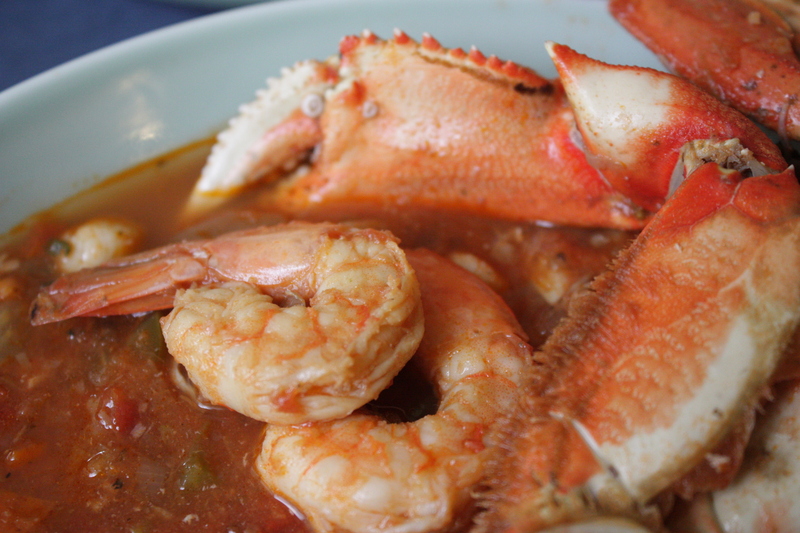 A seafood version of the children’s story “Stone Soup”, if you will. 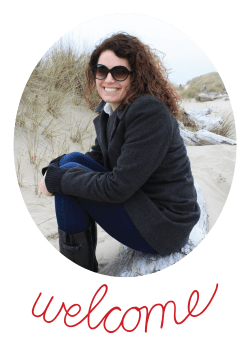 Historians actually believe the soup was based on several different versions of similar seafood dishes found in the coastal areas of Italy where North Beach residents immigrated from. 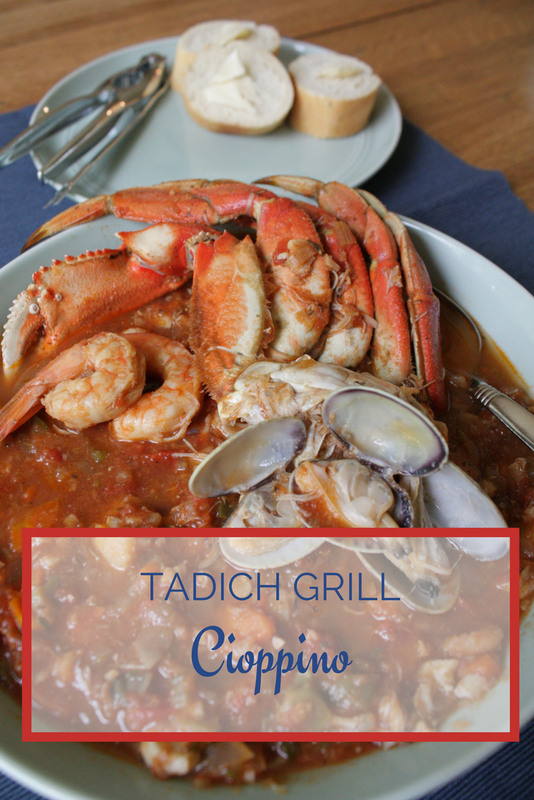 Ciuppin from Genoa and cacciucco from Tuscany are two styles with similarities to cioppino. 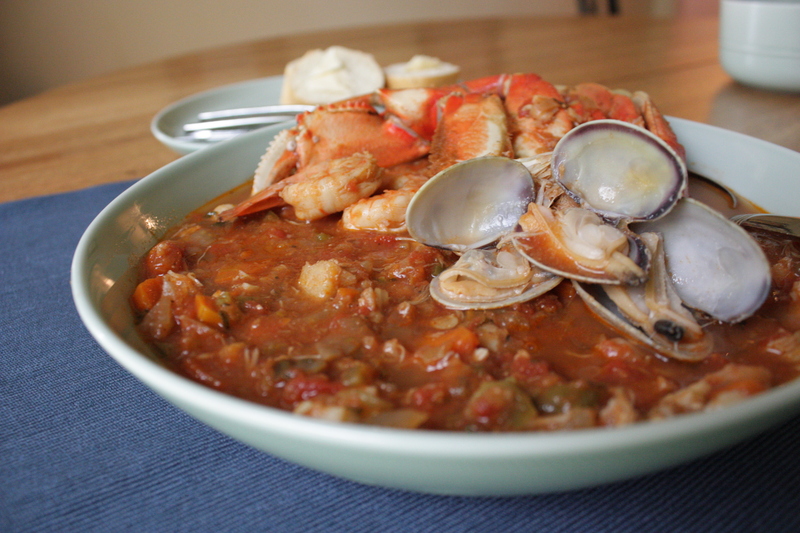 No matter the true origin, I promise that if you love seafood, you will fall in love with this cioppino. Heat ¼ cup olive oil in a dutch oven or large heavy pot over medium heat. Add onions and sauté one minute without browning. 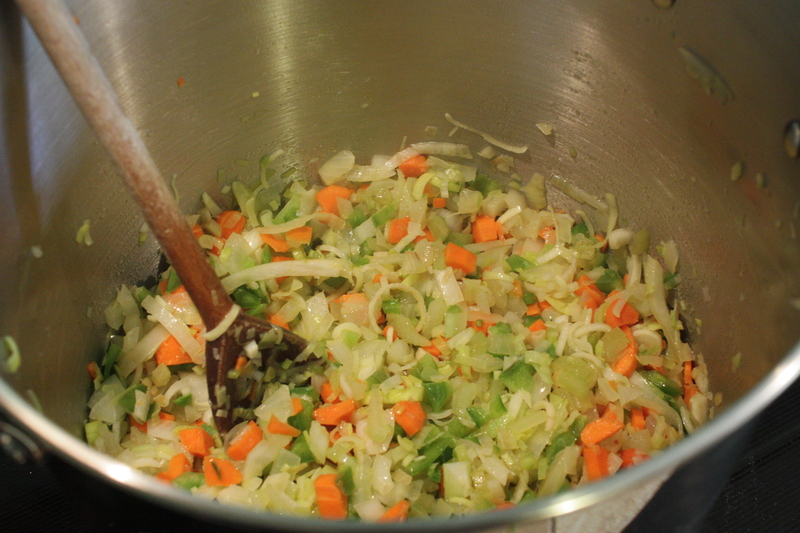 Add carrot, bell pepper, leek, celery, and fennel, sauté 5 minutes. Stir in crushed tomatoes, tomato paste, water, salt, pepper, basil, thyme, oregano, bay leaves, and cayenne. Partially cover and simmer over low heat for two hours, stirring occasionally. Remove bay leaves. 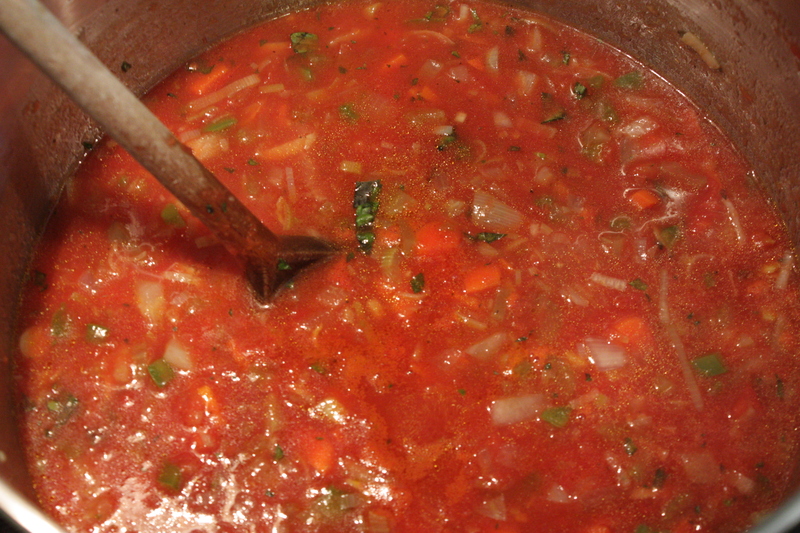 The sauce can be covered and kept warm over low heat for several hours longer if desired. Make sure to stir occasionally. Heat remaining ¼ cup oil in a large skillet over high heat. Add garlic and cook 5 seconds. Immediately add fish, shrimp, and scallops, sauté until just cooked through, 2 – 4 minutes. Add seafood to sauce and gently stir. Pour wine into skillet and cook 30 seconds over medium heat, stirring up any loose bits. Add clams to skillet. Cover and cook until clams open, 2 – 6 minutes. Transfer clams as they open to sauce. Discard any clams that do not open. Gently stir shrimp meat, crab meat, and crab legs if using into the sauce. 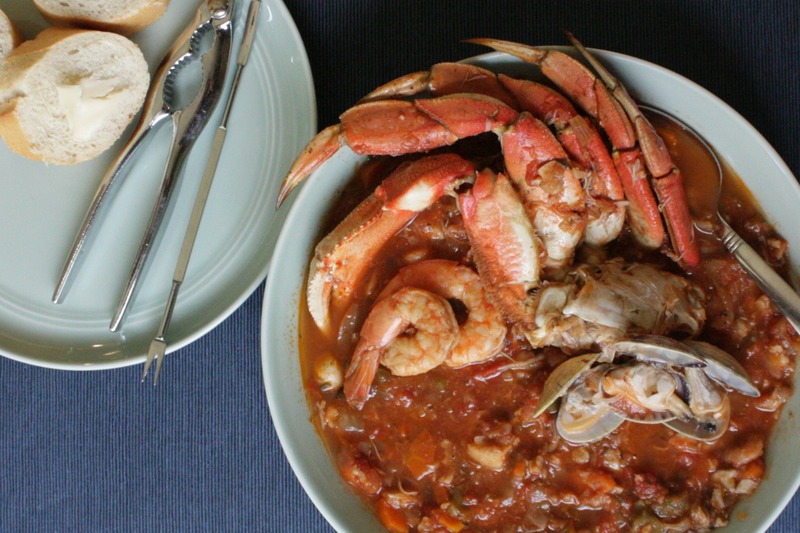 Cover and cook cioppino until all seafood is hot, 2 – 3 minutes. 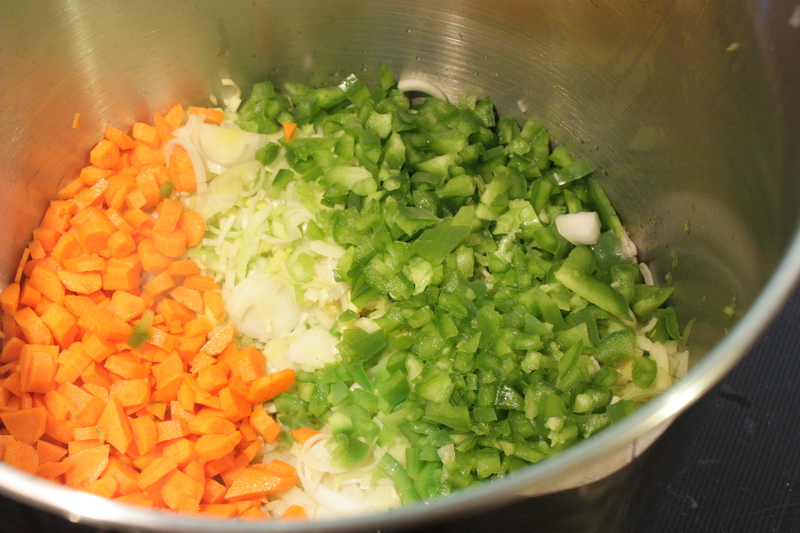 Ladle into soup bowls and garnish with chopped parsley. Serve with warm San Francisco sourdough bread and a generous helping of parmesan cheese. Enjoy! The seafood listed here is what Tadich Grill uses. Feel free to deviate by using your favorite seafood, or whatever seafood is freshest at the time. We almost always double the amount of seafood that the recipe calls for and we’ve also added calamari rings, and mussels with success. If using mussels, cook them as you would the clams. This recipe can be doubled or even tripled if you’re serving a large group. I’ve had great success making the sauce in large batches, freezing it, and then finishing off the recipe with fish, shrimp, crab, and clams when the mood strikes.